Posted on July 28, 2013 by Hong Kong Wargamer Tagged AARAdvanced Squad LeaderArnhemASLBoard Gameboard wargameOperation Market-GardenPBEMScenarioScreaming EaglesVASLWorld War II	CommentsNo Comments on S14 88s at Zon – a real nail biter!! S14 88s at Zon – a real nail biter!! 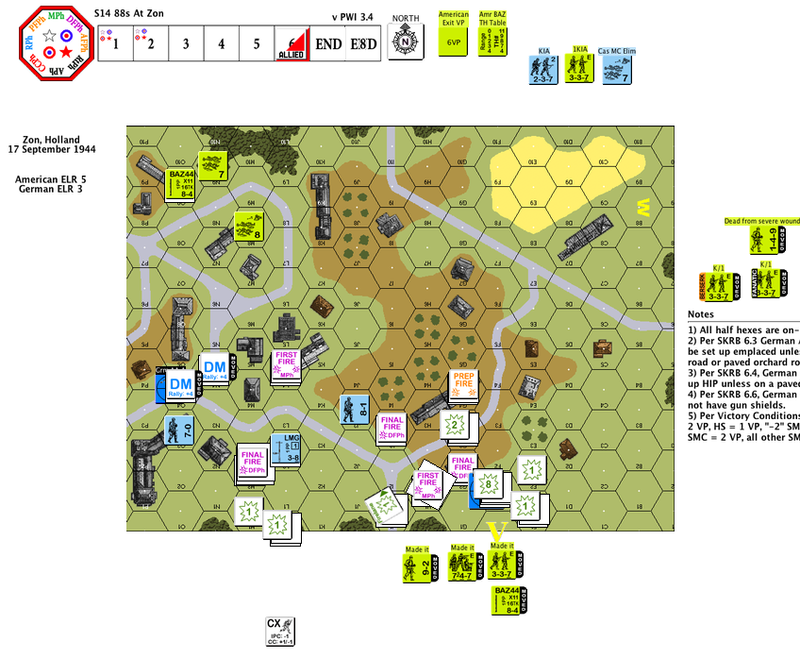 S14 88s at Zon is a starter kit scenario about the 101st’s run-in to a number of 88mm guns by the Zonsche Forest near the bridges over the Wilhelmina Canal. These bridges were vital to the British tanks that needed to dash through to Arnhem in Operation Market-Garden. This is a 5 and half turn scenario that uses half of board w. There’s a hill in the middle of the board that leans towards the right. The right (east) part of the board is open ground and the left (west) is a little village with a meandering road going from north to south. The Screaming Eagles come in from the north and have to exit a certain number of units to the south (presumably where the bridge was). The Germans have 2 x 1st line squads, 4 x 2nd line squads and 2 x 88mms. I situated the 88mm guns at M2 and H1. The Americans have 11 squads of 7-4-7 firepower goodness, an MMG and 2 x bazookas. The American push through the village to the west was slow. Time in time again, the use of spraying fire and fire lanes show its effectiveness even at low firepower when coupled with FFMO & FFNAM modifiers. The German tried to skulk as much as possible during their turns but once when they got careless and the Americans shot clean through four buildings (M7 to L3) and broke their HS in the open ground beyond. The 88s were scary. Most shots they did had a base hit of 8 and when the hits land, it’s a FP16 flat shot all around for the whole squad. The American did better for the most of the scenario in the open grounds to the right (west). However they found themselves running out of time towards the end and most squads got shot in their rush towards the entrance. The Most Epic Moment goes to the Close Combat round when a paratrooper squad jumped a German 2nd line squad. The Germans got Ambush so they started cheering their lungs out. Then they rolled boxcars which started the Americans cheering! The Americans figured they were there to clean house so they stayed and looked to kill the German squad once and for all. The Germans decided that’s already enough fun and so they infiltrated their butts out. The most True To Real Life award goes to the American 8-1 leader who ran past Subsequent First Fire and through residual fire unscathed only to be shot in the back by a LMG 5 hexes away and broke at the exit hex. The Most Heroic award though goes to the German 7-0 leader who stood his ground, concealed for most of the game pretending to be a squad at O3 (in the building to the lower left where you see him now). Erwin is a great opponent to play against and I learned a bit more about guns and about laying residual fire in this scenario. Now for the next one, any recommendations? 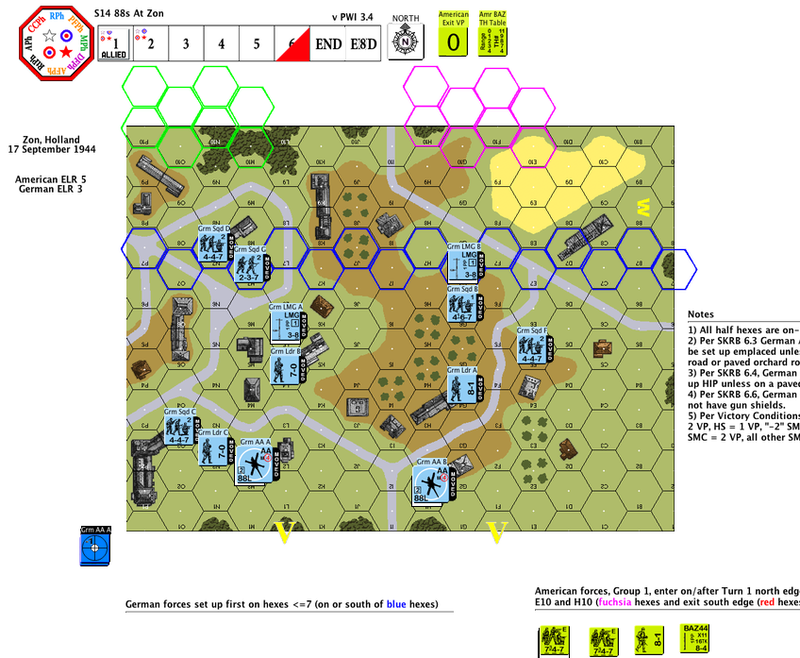 This entry was posted in Game Play and tagged AAR, Advanced Squad Leader, Arnhem, ASL, Board Game, board wargame, Operation Market-Garden, PBEM, Scenario, Screaming Eagles, VASL, World War II. Bookmark the permalink.